The Premier Event for Buick Reatta Enthusiasts. Display ads for the 2013 Reatta Rally will be in the May and June issues of the Buick Bugle. A short while ago I decided to separate the ReattaDriver web site from the Reatta Rally. I registered the domain name Reatta Rally and have been in the process of creating this web site. Unlike previous years, the Kiawanis will not be serving a pancake breakfast this year. Why??? Because they will be on vacation (go figure). Once it has been determined who will 'cater' the All GM Show, registration forms will be available. Registration forms should go out sometime in the next few weeks. Registration fee will be $20 ($25 day of event). I am not able to offer complimentary registration for the show but attendees will receive something special to commemorate the event :). If a few participants will be coming from far away (NoCal, Washington, Arizona, etc. ), or if the 'locals' like the idea, I will happily extend the Reatta Rally into the following day with events planned that will have a SoCal theme. It's near the end of the month and I don't yet have the information I was looking for. What is certain is the location (same as last year) and the date - Sunday, June 23rd. Stay tuned as I hope I have some news to share soon. January 1, 2013 - HAPPY NEW YEAR! I hope by the end of this month to have more information to post about the Reatta Rally. CONFIRMED: The 2013 Reatta Rally will take place on Sunday, June 23, 2013. 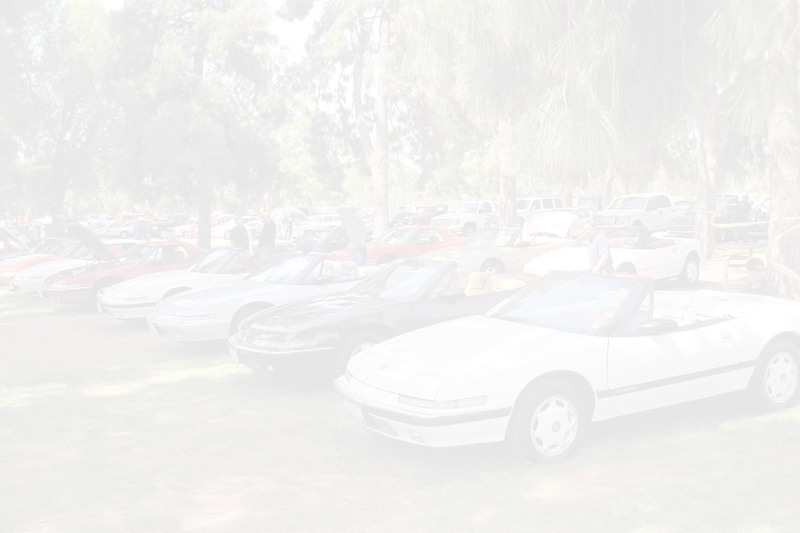 It will take place within the annual All GM Show (held the same day) at Woodley Park in Van Nuys, CA (a suburb of Los Angeles). Further details along with the registration form should be available on-line the first quarter of 2013. Yes, there will (hopefully) be a 2nd Reatta Rally coming in the summer of 2013. It will most likely coincide with the annual All GM/Buick Show held in Los Angeles. I anticipate the date will be on a Sunday in June. Check back here or at the home page for as soon as I have a confirmed date, I will post it on-line and planning for the 2nd Reatta Rally will begin. There hasn't been much going on locally in the 'Reatta World'. Of course, having this web site crash (and not updated for a few months) didn't help matters. But I'm up 'n running and should have some news regarding the next Reatta Rally shortly. If anyone has any recommendations (i.e. location, activities, etc), send me an e-mail using the button at the left column. The Reatta Rally was outstanding! Expectations exceeded anything I could have imagined. 15 Reattas in all came to the show (it would have been 17 but two cars had mechanical problems but the owners did come to the event). The local Buick chapter couldn't have been more pleased with the turn out. One Reatta received special recognition from the All GM Show; awarded a 'best in show' plaque. Every single attendee was thankful twice over for putting the event together and complimentary on how well it was organized. Half way through the show I was already asked by most when will the next event be .The swag each attendee received should be a template for anyone organizing a similar event. From inception to the day of the show, time putting the Reatta Rally together was well spent. Must do this again. This will be a darn good show! Final tally are 14 Reattas pre-registered with a 50/50 possibility of two more Reattas to register the day of the show. If all goes as planned, this will be the largest known gathering of Reattas nationwide that doesn't coincide with the BCA (Buick Club of America) national meet. And...it seems about 1/3 of attendees are not members of the BCA or Reatta Division (see what a little advertising on the internet will do!). There are now Reatta owners who know there are other owners in their community who they can confer (or commiserate) with and will happily assist with any problems or situations with their cars. A final e-mail update went out earlier today to all attendees requesting they come to the show as early as possible (no later than 7:00AM). This assures we can display our cars as a unified presence instead of showing up too late and having Reattas scattered throughout the show. The most impressive display of cars and those that left a lasting impression on me at various shows were when the same make and model were parked side by side. 14 Reattas will be at the Reatta Rally, two will attend without their cars and I'm waiting to hear from one other. Until the last day of this month (Thursday, May 31), as long as I have a completed registration form, I will have the registration fee waived for all late comers (and procrastinators). As the show nears, more interest develops. 11 Reattas are confirmed with 2 owners to send in their registration form by tomorrow, three others undecided and two others to attend but without their cars. Because of the overwhelming support I've received for putting this event together, I'm going to have the registration fee waived for all late comers until the day of the show. There are now 10 Reattas confirmed for the Reatta Rally! Waiting to hear from three others. Of the four who responded whether or not they want an activity after the show, two said yes and two can't make it . Will have to see how things materialize at the rally. Maybe a few owners will want to go sightseeing, do a bit of cruising and end up somewhere 'interesting'. I'm putting a 'Reminder List' together of items attendees should know and may want to bring along (i.e. : a lounge chair). I'll send it via e-mail sometime next week.